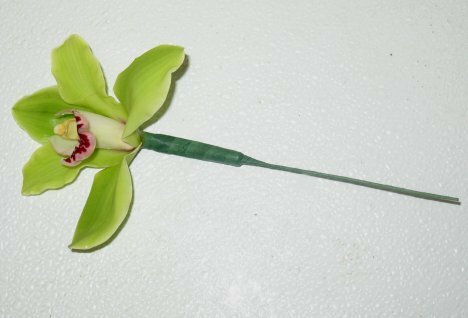 Cymbidium orchids have very short stems, so you can lengthen them with wire. I like using Stay Fresh Stems (you know, as a florist I'm always thinking "water, water, water"). 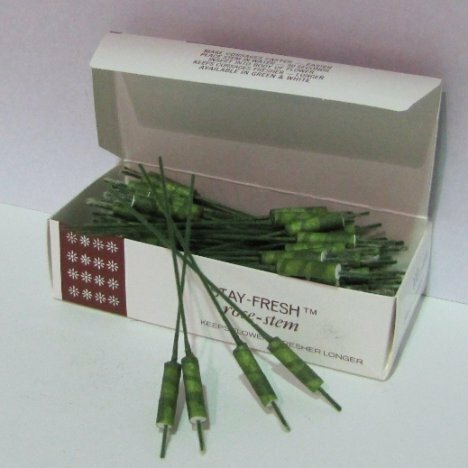 Simply soak them in water treated with fresh flower food and they are ready to use. If you don't have these, you can substitute a "hard" Q-Tip (like those to remove makeup). 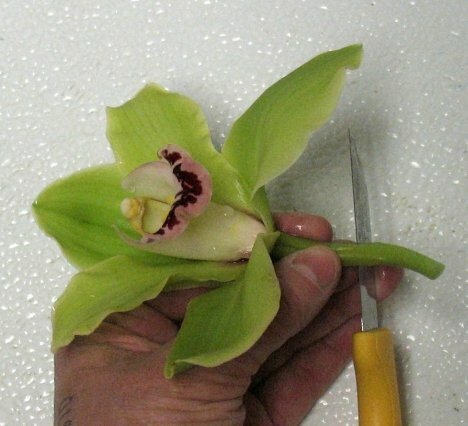 Cut a clean edge off the bottom of the cymbidium orchid stem. 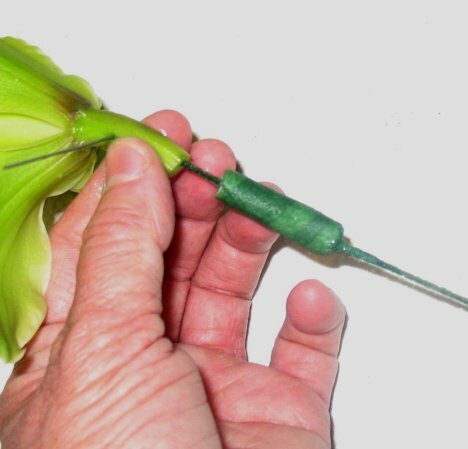 Push a 22-gauge wire through the thick flower stem. 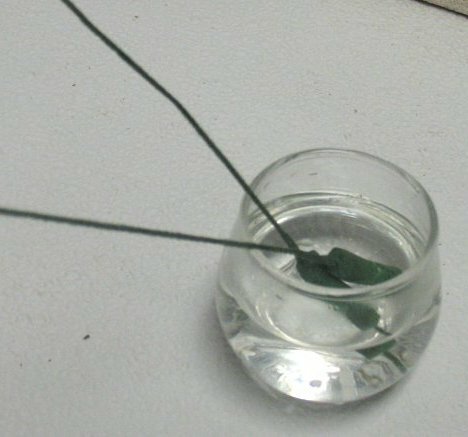 Create a second wire as a loop hairpin as shown. 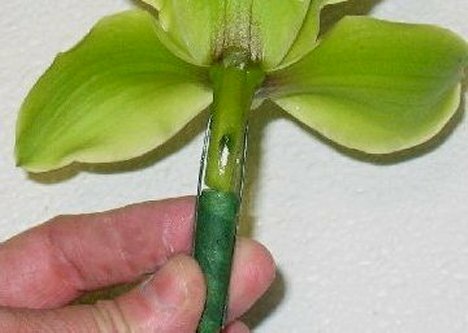 Push the soaked flower stem against the cut end of the orchid. 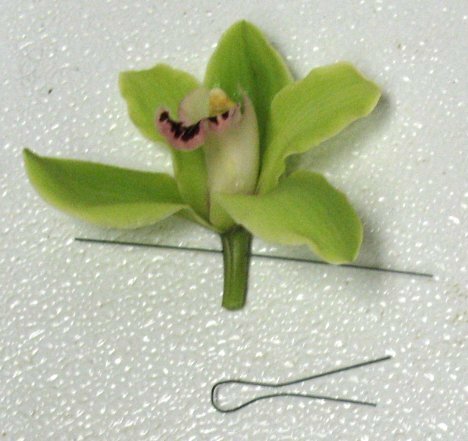 These have a wire to insert up into the cymbidium stem. 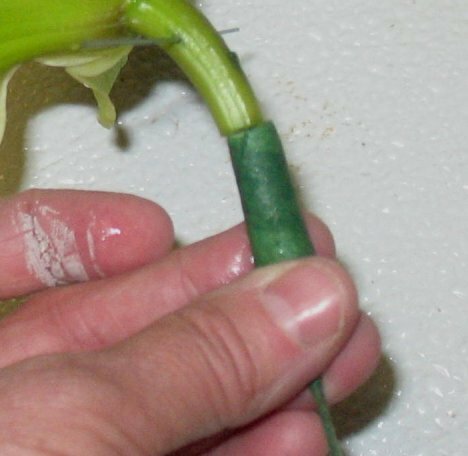 Push firmly that the wet cotton meets the cut end of the orchid. 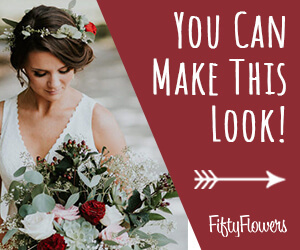 Bend the looped wire and place behind the top flower petal. 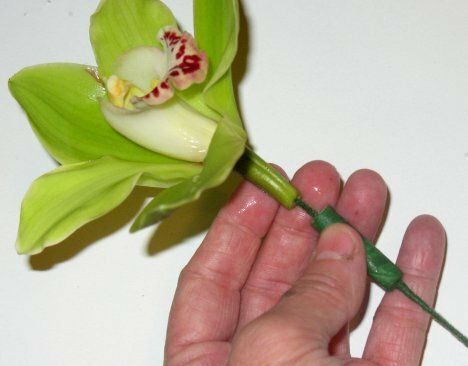 This just helps give a little more strength to those orchids. 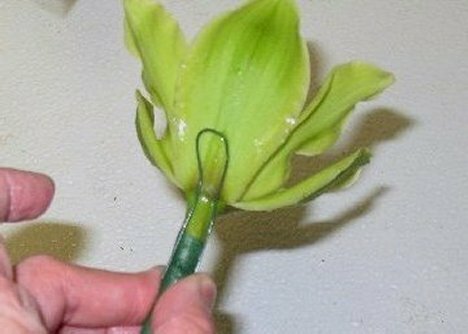 The looped wire should fit firmly against the back of the petal. 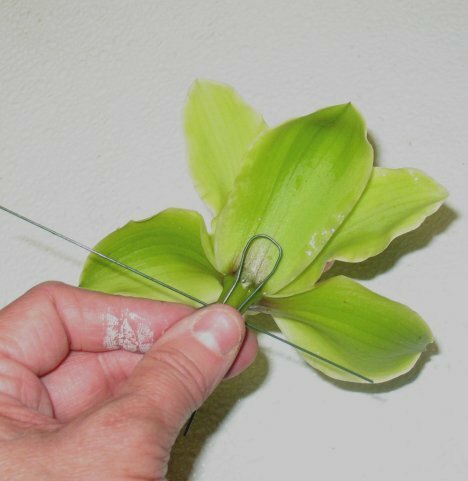 Fold the wire above down so both sides are parallel with the stem. 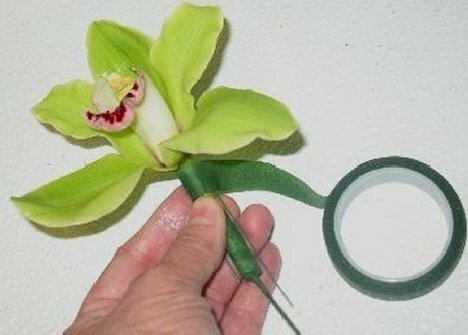 Tape into place with green florist tape. 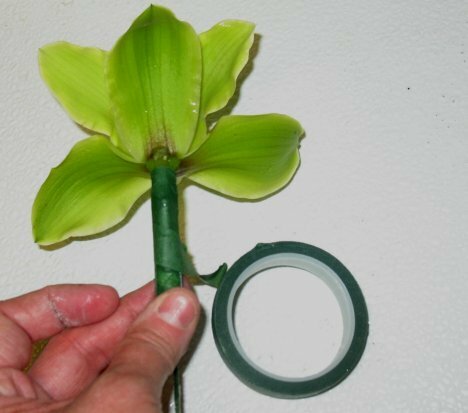 Pull the tape, which has a lot of stretch and it will adhere to itself as you twirl it around the flower stem. 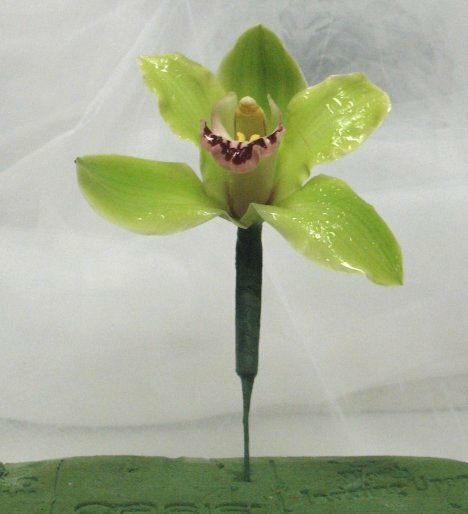 You now have a cymbidium orchid with a lengthened stem. Insert it upright into a block of foam until ready to use. Mist lightly with Finishing Touch.